From other blogs was immersed deep down in my blog label and since I had some recipes tried out from other blogs,I decided to brush it up with this post. I am uncertain about posting recipes from other blogs.Personally,I would love it if someone tried a recipe from my blog and blogged about it,but I recently discovered not all people think alike.I have tried many recipes from cookbooks,internet and now food blogs.I’ve succeeded many a times and have had to throw the entire stuff out many more times.I am not a great cook and I believe I am still learning.I would never have ventured into baking if not for blogging.Almost all my baking recipes are those which I tried out from many of your blogs. Somehow,trying out a recipe from another blog gives you that extra boost of confidence.Contrary to recipes from a cookbook or website,this one has an extra advantage of having passed the test at someone else’s kitchen.And that’s what makes it tempting to me.I always write down the recipe or save it in word so that I can use it for future reference.I add the recipe to the post only to keep a record for my own sake.I have come across many linked recipes-sometimes the links don’t work and sometimes the recipe owners make the blog private.I have reproduced recipes myself and I have no intention to take credit for the recipe or to call the recipe my own. Without further ado-here’s four super-duper baked goodies I tried out-From your blogs!! Deeba’s Chocolate Yogurt Cake – Deeba needs no introduction in the blogosphere.Her posts are awesome and always leaves me drooling over the amazing pictures that she takes.I was tempted to try out this cake primarily because of the fantastic pictures[tooooo good] and then I make a similar recipe myself.The outcome was simply superb and I can vouch for this.One of the best chocolate cakes I’ve made so far.I got two small cakes and it is a superhit with our friends. Changes I made-None..the cake’s a winner!! 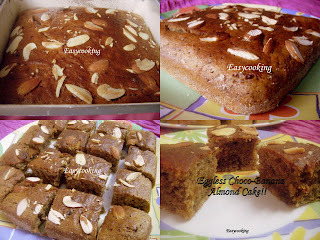 Sunita’s Choco-Banana-Almond cake – I started making banana-based baked goodies only recently and I am hooked.I buy extra bananas these days and keep them aside for baking.I made this cake a while after Sunita posted it. Changes I made - The only change was-I made it eggless.Yup!.I had read somewhere that banana acts as a egg replacer so I skipped it altogether.I got a dense cake but tasty nevertheless.The grated chocolate in every bite gave the cake an extra kick!! Bindiya’s Jam centered muffins – Much before I started blogging,I chanced upon Bindiya’s blog when I searched for Instant pizza[its another thing that I haven’t made it yet].I have loved her My favorite things series and plan to send something for her Heart shaped cooking event. Changes I made – I followed my own recipe for muffins and filled the center with jam.Absolutely delicious. Sowmya’s Fruity Cake – I remember having Frooty bread from our local bakery and loved picking at tutti fruttis..;-).Had bookmarked Sowmya’s recipe the moment I saw it. Changes I made – Again,I followed this recipe and added tutti frutti to the batter and baked in a loaf tin.Despite flouring the tutti frutti,mine sank to the bottom-please help! wow..love each one of your bakes..cakes and muffins are so droolworthy..am so happy you tried my fruity cake..yours look gorgeous..
Wow..the all the baked goodies r mouthwatering!Tutti fruitti looks spread out in the lovely -best than bakery- slices..flouring is the only tip that I too know of! The jam wala muffins look fluffy n moist as well! I love making dishes from other bloags as you said they are full proof. I must adlit i have tried lots of recipe from different blogs and till now it all came out perfect. I also think one main reason i try things from other blogs is it because i can see how the food looks like unlike in some books. amazing cake..Divya. Very tempting and mouthwatering..
wow! you are quite a prolific baker! love the spread. Lovely cakes and muffins Divya. I have also tried many recipes from different blogs. Most of the times they are a hit but a few times the outcome fails to impress me. Maybe I go wrong somewhere in the recipe or it just doesn't suit my taste buds. After all each person has his/her own likes and dislikes. Blog has the only convenient, even if we mess around, we can ask the blogger to clarify not like website or book! I really love the tutty fruity , great picture Dhiv! I too just bake today sowmyas fruity cake, i coudn't resiste them after seeing here too yesterday. Will post it soon. Your fruits didnt sink that much compared to mine. Will try to post them tommorow. All of them are so lovely divya...kudos for trying out and giving such great feedback! Wow Divya, as I scrolled down, the goodies kept getting better!! I can't pick which I would like more, coz they all look too good. Your tutti-frutti looks so spongy and delish, reminds me of the Monginis cakes :)..